Colliers International has announced the successful completion of the new facility in Technology Park Brno for the Czech subsidiary of Red Hat, Inc., the world’s leading provider of open source solutions. Colliers acted as the leasing advisor and project manager for the $9-million fit-out of the 4,000-square-metre facility for Red Hat, who were seeking to create a working environment that would help attract and keep the best talent coming out of the technical universities located in Brno. In 2016, the US multinational software company was named one of the 12 best employers in the Czech Republic by global HR consulting and outsourcing firm Aon Hewitt for the fourth time, in recognition of its famously open culture based on collaboration and ideas sharing. 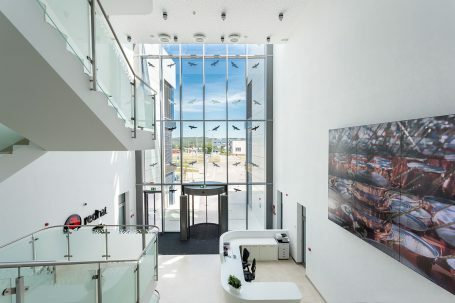 The butterfly-shaped building designed and constructed by K4 Architects & Engineers is the second building Red Hat has leased at Brno Technology Park. The beautiful foyer includes an open staircase and link bridges that connect each wing. The fit-out was designed by Interior Architects from the UK along with Red Hat’s own Global Workplace Team. They have created an environment that fits with the Red Hat operating model with a range of work / task based settings, meeting rooms that allow for privacy or collaboration and break out areas all designed to facilitate the free exchange of ideas. This high tech space includes a private gym, wellness centre and library, break out and games areas, providing an extremely attractive working environment for the approximately 350 staff who will work there. Colliers have been supporting Red Hat since 2013 providing Agency advisory and Project and Cost Management services. This project took 12 months to design and complete, the hand over was on time and the facility went live on 12th June after all the IT, audio-visual and other technical equipment were operational. “We are delighted to have completed this wonderful new facility in time and within our budget with the help of Colliers acting as our Agent and Project Managers throughout the construction and fit-out,” said Rob Lewin GWS – Director for Delivery EMEA at Red Hat EMEA. “I am proud to have supported Red Hat negotiate the leasing conditions of their second build-to-suit building within Technology Park Brno. It was a pleasure to work alongside one of the world leaders in computer technology, who also place such a high priority on their employees’ well-being and comfort at work,” said Radana Williamsová, Senior Associate, Office Agency for Colliers International in the Czech Republic.